Missing teeth affect our day to day lives in many ways, sometimes with very serious consequences to our well being. Teeth implants also known as dental implants are the most convenient and comfortable way to replace missing teeth. Dental implants are the strongest and longest lasting method to replace missing teeth. Whether it’s just one missing tooth or replacing many missing teeth, dental implants allow people to smile, eat anything they’d like, and sometimes to help secure dentures into place. While the cost of a dental implant is initially higher than alternatives at first, because they typically last longer than other methods their long term cost can be much lower. A tooth implant basically replaces the root of a tooth and acts as an anchor to attach a tooth on top of it. They have a very high success rate (over 90%) and have a very high patient satisfaction rate. There are certain factors which determine if you’re a candidate for dental implants and if you have been told that you’re not a good candidate, come in to see if we can apply special techniques or bone grafting to make you into a candidate. Dental implant surgery can improve your quality of life in many ways. Dr. Tony Kim at the Dental Day Spa of Hawaii Specialty Group in Honolulu, Hawaii can help you in your search for information on dental implants. This illustration shows how an implant replaces a natural tooth. Further down this page is a video going over the separate parts of the tooth implant. Why do I need Dental Implants? You can replace a single missing tooth or several teeth. This is done in conjunction with other parts such as implant abutments and implant crowns. All parts are necessary to create a lifelike tooth. Dental implants and implant bridges can replace many missing teeth. Having teeth that are fixed into place and that aren’t removable is the most comfortable of all options. Loose dentures can be locked into place with dental implants and special attachments. The dentures can still be removed but are much more stable than traditional dentures. Some people like the fact they can remove the dentures because they’re much easier to clean. Replace badly damaged teeth that are beyond repair and skipping years of spending lots of time and money on hopeless teeth. Sometimes badly damaged teeth can create problems for many years and then still end up needing extraction, even after extensive work to save them. Implants are a great predictable option to replace a badly damaged tooth. The dental implant (also known as an endosteal implant) can be thought of the “screw” portion which is placed into the bone. The implant itself really can’t be seen when there is nothing attached to it because it’s often covered by your gums when fully healed. The implant abutment is small piece that is attached to the implant. The abutment allows other things to be connected to it such as a crown, bridge, or denture attachment. The abutment is normally attached to the implant after a few months when the implant is secured by bone. An implant crown is usually the last thing attached to a single dental implant. This is the part that looks like a tooth. It’s normally cemented onto the abutment but sometimes I use designs where the abutment and implant crown are fused into one piece and then screwed into the implant itself. There are advantages and disadvantages of each type and Dr. Kim will decide which one best suits you. Dental implants can last a long time. Usually the longest lasting type of dentistry. Nothing lasts forever but implants on average have the longest lifespan of any type of restoration. 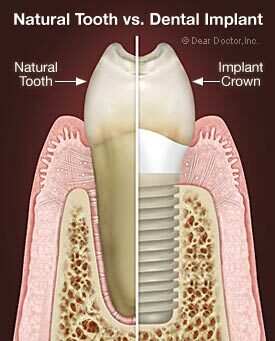 Sometimes the implant crown may have to be replaced as it wears down (just like a natural tooth) but the implant in the bone is usually OK when an implant crown needs replacing. Made out of titanium or zirconia which are extremely strong materials. There are other materials such as tantalum that are available but there are certain advantages and disadvantages to different materials types. Dr. Kim will help decide which is best for you. Your bone actually grows and attaches to the implant. Once it’s integrated into your body, it’s almost impossible to take it out without drilling around the implant. That’s is why they have such a high long term success rate. Can give back a smile. Missing teeth can make somebody either hide or avoid smiling due to embarrassment. People also have adapted smiles where they move their lips in a certain way to avoid showing a space in their smile. This can definitely affect somebody’s self confidence and may make them avoid social situations. With proper planning implant teeth can look just like the surrounding natural teeth. Planning needs to take into account the bone, the height and amount of gum tissue, and material choice. Many factors go into planning for an implant that looks like a normal tooth. But once properly executed, the finished implant, abutment and crown should look just like a new tooth. Can attach a full set of teeth which look beautiful which can be fixed into place. These are also called implant bridges or hybrids. These types of implant prosthesis are more challenging to place and may take more time and have an increased cost but having a full set of beautiful teeth secured by many implants is a life changing process. Missing teeth can make it difficult to eat the foods you love. Crunchy, chewy and tough foods are difficult to chew properly without all your teeth. And if you exclusively chew on one side of your mouth, it can have affects on the entire chewing system over a period of time. Many times these changes are difficult to correct without orthodontics or major corrective surgery. Whole body health is better when you can chew healthy foods like vegetables and nuts. Proper diet is much easier to maintain when proper chewing is in place. People who can’t chew well tend to just avoid certain foods due to the discomfort and hassle of trying to eat those foods. They can secure loose dentures which are falling out when eating or speaking. This is one of the biggest fears for denture sufferers. It’s one of the most embarrassing things that can happen in public! Dentures attached to implants have a much lower chance of coming off. Replacing missing teeth up front can help people smile again. I always tend to notice people smile more after I replace missing front teeth. Loose denture sufferers can now eat in public at their favorite restaurants. Many denture sufferers have told me that they don’t bother going to their favorite restaurants anymore for fear that there dentures may fall out or that so much food gets stuck that it’s very uncomfortable. Securing teeth leads to confidence when eating. Don’t have to damage the surrounding teeth. Conventional bridges require the shaving down the adjacent teeth to replace the missing tooth. This one of the main reasons I prefer dental implants over fixed dental bridges. Success does not hinge on the health of the surrounding teeth, a disadvantage of conventional bridges. If any of the anchor teeth in a bridge fails, then it usually means a new bridge has to be made which may be weaker than the original one since more tooth structure is removed each time. Full dentures can affect speech due to the coverage of the palate and movement of the denture during speech. The thickness of dentures blocks the tongue from it’s normal movements during speech which can cause lisps and slurs during certain phrases. A fixed set of teeth without the palate can restore original speech. Maintains and protects surrounding bone. You may have heard that teeth in bone help maintain bone levels. Implants can have the same effect on the bone too. Sometimes a person will place dental implants just to maintain bone and then attach the teeth many months or even a few years later. More bone means healthier jaw. it’s always easier to keep what you have versus trying to rebuild it later. Maintains facial structure when bone is maintained. A person without any teeth with have the facial structure collapse which makes them look even older than they are. A person with healthy bone structure will usually look younger. You can’t get cavities on implants. This sounds fantastic but it’s not an excuse not to brush. Implants are susceptible to gum disease still so have to be maintained with proper brushing and flossing just like regular teeth. In some circumstances, an implant can be placed at the same time a tooth is extracted. They are called immediate implants and they require enough surrounding bone and most likely require a bone graft to be placed at the same time. Most times, the immediate implant is placed but no temporary can be put on because of the lack of stability. However, in some cases if there is enough strength on initial placement then a temporary can be placed at the same time too. To see if dental implants are right for you then please contact Dr. Kim at his Honolulu office. And remember, if the idea of surgery is frightening for you and preventing you from getting a procedure done ask about sedation/sleep dentistry. You must have enough bone to support the implant. If there is not enough width or height of bone then bone grafting should be performed to create the proper dimensions for best results. For upper implants, we need to know where the sinus cavities are. If there is not enough space, it doesn’t mean that you’re not a candidate but then certain sinus grafts and lifts are necessary. It’s a very predictable and common procedure which can really open many options. People taking certain drugs for osteoporosis should be very careful before getting dental implants. Bisphosponates can lead to a condition called osteonecrosis when oral surgery is performed. Ask if you’re a candidate if you’re taking these medications. Diabetes and smoking will greatly hinder healing and ideally need to be under control before getting getting dental implants. The first visit is a free initial consultation to talk about what your dental concerns are. You should also get a chance to ask questions about your dental implant needs and meet the doctor. It’s very important that you trust and feel comfortable working with the dentist. The second visit is an examination and record taking appointment to give the doctor the information to study your case. Dr. Kim likes having a 3D scan available to study where the nerves and sinuses are to avoid damaging those areas – this requires a visit to a special xray lab for a cone beam scan. This cone beam scan will allow Dr. Kim to study the case with precise measurements before any procedure is started. He can also virtually place dental implants on the computer to see if he can deliver the type of prosthesis you need. Next is a consultation appointment to go over the doctors findings and recommendations. Timeframe and cost of treatment will be discussed. Of course, you’ll have another chance to ask questions. Once a treatment plan has been chosen, next comes the dental implant placement appointment. You can expect an hour and half appointment or longer if multiple implants are placed. A week after implant surgery comes the post operative visit to check healing. This takes usually less than 30 minutes. After waiting 3-6 months for bone to grow onto implant, you’ll come in to evaluate the bone and get started on the final implant abutment and crown. You shouldn’t feel any discomfort during this period, in fact you won’t feel anything happening during this time. If healing is complete then we place an abutment onto the implant and then take a final impression with special impression copings which get sent to our dental lab. They will then create the final implant crown and customized abutment and send it back to us. Once the implant components arrive, you come in so we can place the final implant crown and abutment. This usually takes under an hour. As a note, the vast majority of our implant cases are not painful, in fact most patients are OK to just take over the counter pain medications. When there is not enough soft tissue in an area, an implant crown can look too long and have larger gaps on both sides of the tooth resulting in food traps and an unattractive appearance. Soft tissue grafts can be added to bulk up the tissues around the implant to prevent these problems. This tissue can be taken from your own body (roof of the mouth) or from purified cadaver tissue. These tissue grafts can also be placed around root surfaces exposed from gum recession but we’ll focus on the implant use. Sometimes when the gum recedes around an existing implant and the grey or silver implant threads become visible, sometimes soft tissue grafting after disinfecting the implant can work. A flipper or temporary denture to replace the missing teeth may be used. They look like traditional orthodontic retainers except they have plastic teeth attached in the areas of the missing tooth (teeth). Flippers are not very good for chewing because they are not very stable. However, they can look decent and look much better than a missing tooth. Usually people will have to clean them off after eating because they also tend to collect food. An essix retainer looks like an Invisalign tray. They are clear and snap on to all the teeth on the arch. They are more sturdy then a flipper and also have fake teeth in the missing teeth areas. It is a bit easier to eat with them on but they will also collect food. These work well but require many teeth to snap onto. A traditional acrylic temporary can be attached to an implant or implants. They utilize temporary abutments to anchor the temporary onto the implants. As mentioned earlier, they require a strong initial placement in strong bone. You also have to avoid chewing on the tooth because too much pressure will endanger the implant. This technique is best utilized in front teeth for cosmetic purposes and will be one of the best cosmetic implant temporary options. A traditional bridge temporary which attaches to the adjacent teeth of the missing tooth. These adjacent teeth have to be prepared often to attach the temporary bridge so this option works best when there are already crowns on the adjacent teeth or if they are also damaged and need repair. For a temporary when all teeth in an arch are missing, an existing denture can be converted to a fixed screw in temporary if enough implants are placed and the bone is strong enough to support the temporary. This is the typical temporary in the all on 4 or implant denture option. Sometimes no temporary is used or a tiny plastic cap is attached to the implant. This option will be the least cosmetic but will be the most affordable. Immediate implants can be a wonderful procedure which can save you months of waiting. Usually, a tooth is extracted and a bone graft placed. After 3-4 months then the implant can be placed. Once the implant is placed, another 3-4 months goes by before a tooth can be made to attach to your implant. So it can possibly take 6-9 months before you get your final tooth and if advanced grafting is necessary or if healing takes much longer than expected it can take up to a year. An immediate implant is placed at the same appointment when the tooth is extracted. There must be enough bone for this to occur and if there is enough, the implant is placed in the tooth socket immediately after extraction. Bone graft is placed around the spaces between the implant top and the surrounding bone and if the implant has enough initial stability, a temporary abutment and a temporary crown can be placed onto the implant at the same visit. So, it is possible to leave the office after your tooth is pulled out with a brand new implant and a temporary tooth attached to it. If this procedure is successful, then the final tooth can be placed in a few months. There are more risks involved with this procedure because there is more healing that must occur and too much pressure on the implant during this healing phase may prevent proper healing and integration of the implant into the bone. If this occurs, the implant will need to be removed and the process started again. This image can be rotated, zoomed in, and cross sectioned. The implants can also be rotated in any direction, raised, lowered, etc. This type of planning is critical in cases where the bone is very limited and if many implants are necessary to secure an implant bridge or an implant denture. I send all our cone beam CT imaging to a dental radiologist. A dental radiologist can also give a full report if something suspicious shows up in the scan, which could be critical in finding tumors or other serious conditions. And it’s nice to know that a cone beam CT scan that’s used in dentistry emits much lower radiation than a medical grade CT scan. With the proper software and a dental cone beam scan, it’s possible to do virtual planning for dental implants whether it’s one or an entire mouthful. Because we have the width, height, know the location of nerves and sinus, it’s possible to pick the proper sizes, plan the correct angles and complete a total plan ahead of time before you have a consultation. Once the plan is complete, we can create special guides which are secured to you and act as precise guides to place implants. This is very useful where certain placements are critical to success of the case. Not all cases need this type of precise planning but it is a nice option to consider. Dental insurances do not typically cover these surgical guides so they’re only typically recommended in difficult cases which require the maximum precision. Just know that if a guide is recommended, that usually means that your case has a certain level of difficulty which requires this extra technology. Call Dr. Kim’s dental implant office in Honolulu if you’d like a complimentary consultation. There’s never any pressure or selling tactics to trick you. We’ll give you the information you’re looking for and go over some possible options. A popular type of implant which you may come across is the mini implant. They are usually advertised as a less expensive anchor for removable dentures. They were originally designed as a temporary implant for various uses but they found that they integrated into the bone and held tightly. Once dentists found that they could integrate well also, they were then used for anchorage on dentures. From my own experience, I’ve found that just like any other implant, mini implants work best when there is enough bone to support them. Some of the drawbacks that I’ve found with them are that because of their much smaller diameter versus traditional implants, they are more prone to breakage. If a mini implant snaps off at the bone level or even below, they have to be either left behind or surgically removed. Traditional implants can break too but it’s much more difficult to have a full size implant break. I understand that they are more affordable but my recommendation would be to have fewer traditional implants versus more mini implants for the additional strength and the higher success rate. I do highly recommend mini implants for orthodontics because of their smaller size, ease of placement and ease of removal compared to traditional implants. I have experience with several different implants systems including: Nobel Biocare, Bio Horizons, and Zimmer Dental.